What Does Code P0523 Mean? OBD II fault code P0523 is a generic code that is defined as “Engine oil pressure sensor/switch -high voltage”, and is set when the PCM (Powertrain Control Module) detects either an actual low oil pressure condition, or a high voltage in the oil pressure switch and/or its control circuit. 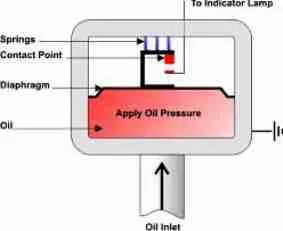 In practice, the PCM in any given application is programmed to recognize a range of signal voltages (that roughly correspond to actual oil pressure(s)) that represent the acceptable oil pressure range for that application. Thus, when the PCM detects a high signal voltage, that by extension could indicate an abnormal oil pressure, it will set code P0523, and illuminate a warning light. NOTE: When code P0523 occurs on some applications, the PCM may set also set code P2105 – “Throttle Actuator Control System – Forced Engine Shutdown”, which means that the PCM has initiated a forced shutting down of the engine to protect the engine. Be aware that when codes P0523 and P2105 appear together, it may not be possible to restart the engine until code P0523 has been resolved. What are the common causes of code P0523 ? Failed or failing PCM. Note that this is an exceedingly rare event in instances of P0523, and the fault must therefore be sought elsewhere before the controller is replaced. What are the symptoms of code P0523 ? How do you troubleshoot code P0523 ?